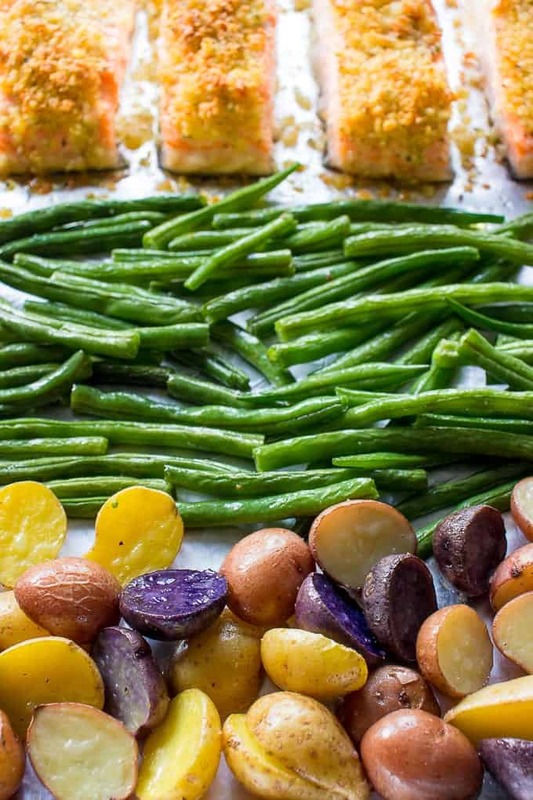 Sheet Pan Salmon Oreganata With Green Beans And Potatoes - So YUMMY! This Sheet Pan Salmon Oreganata With Green Beans And Potatoes is a quick, healthy, and satisfying dinner. Everyone will love the flaky, crispy coating and zesty flavors; this easy baked salmon recipe is bound to become a new family favorite. Are you ready for an easy weeknight dinner that breaks the mold? It’s time to try something new, but there’s no need to learn a complicated recipe. Enter: crusted salmon with roasted vegetables. Salmon is always enjoyable, but when you dress it up with a delicious, crusty topping and bake it with savory vegetables, this simple dinner of sheet pan salmon becomes a delicious meal everyone at the table will want to enjoy again and again. You’ve probably heard of Clams Oreganata before. It’s an Italian-American appetizer served frequently in American restaurants. It’s made of clams topped with breadcrumbs, spices, and cheese then baked to crispy, delicious, culinary perfection. 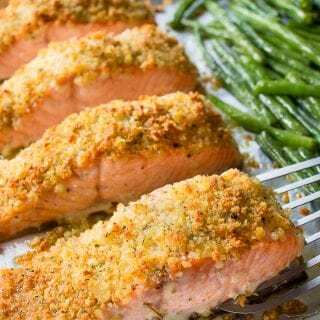 This easy crusted Salmon Oreganata with green beans and potatoes is a simple adaptation of this well known classic treat that you can enjoy in the comfort of your own home. If you’ve ever enjoyed Clams Oreganata at your favorite Italian Bistro, you’re likely imagining how challenging this recipe might be because you know the delectable flavors of the dish can’t be easy to come by. But they are! In fact, this easy backed salmon recipe will wow your family and friends who have no clue how quickly and easily it came together for you. Before you make your crusted salmon, you need to get your veggies all seasoned up and roasting. Simply coat your vegetables with olive oil, salt, and pepper and then spread them on a sheet pan. Place them in the oven and bake them for ten minutes. Crusted salmon isn’t simply a culinary treat to be enjoyed when prepared by a chef in a restaurant. It’s truly simple enough to make at home. 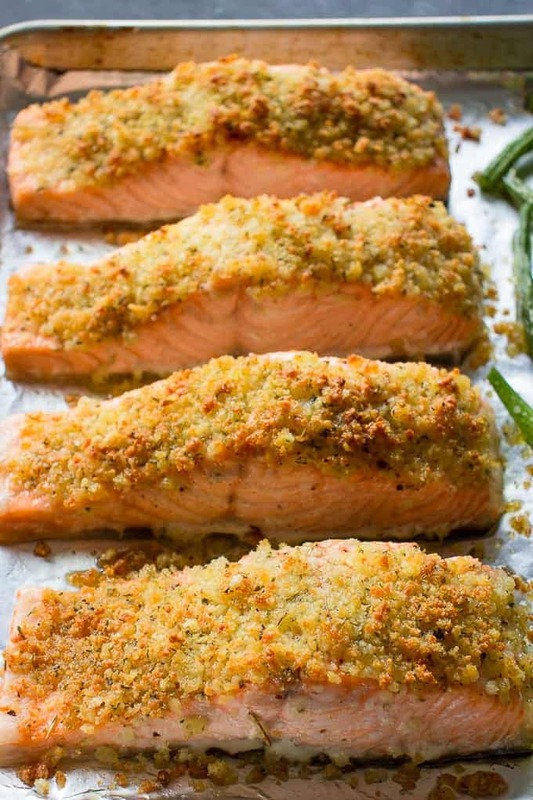 This crusted salmon gets its flavors from the parmesan, lemon zest, garlic, and (of course!) oregano in the breading. 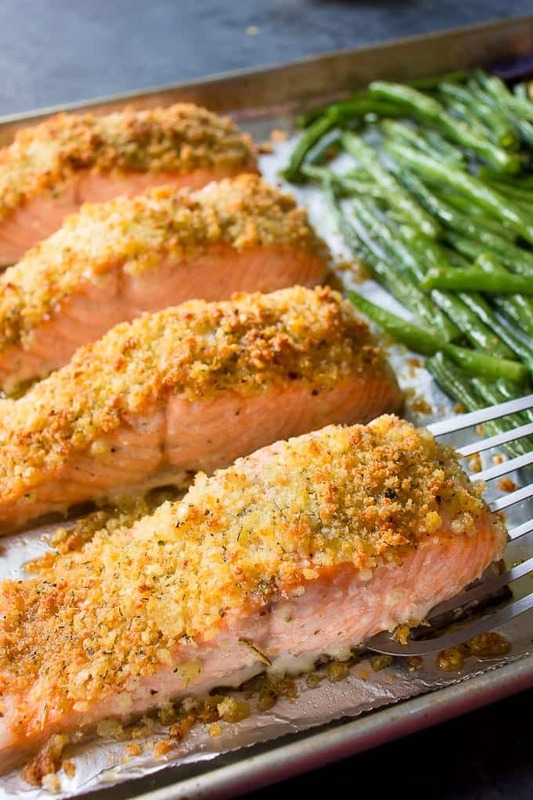 Simply make up your seasoned breading mix with Panko breadcrumbs and press it on to the top of your salmon. Then pull out your sheet pan of roasted veggies, push them to one side of the pan, and add your crusted salmon to the sheet. If you’d like an extra crispy, golden crust you can spray the top of the breading briskly with cooking spray before you cook it. Then all of this flaky and flavor-laden goodness goes into the oven to bake until it is crispy and golden. 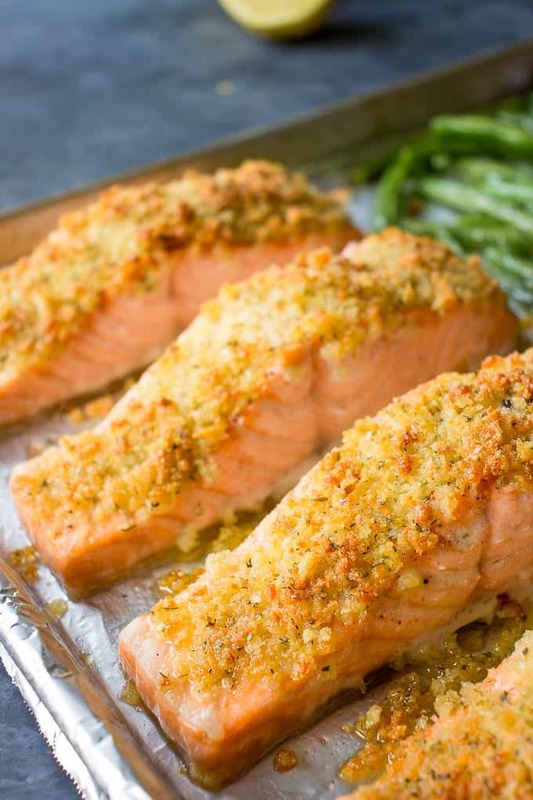 Once you get the crusted salmon into the oven, it’s time to set your table, pour some wine and get ready to devour! This simple sheet pan salmon will be ready to enjoy in about 15 minutes, and should be served immediately. Simply pull the salmon and veggies off the sheet pan, put them on a plate, and enjoy right away. Bon appetite! Herring Smorrebrod – classic Danish open-faced sandwich with pickled herring and vegetables. If you make this recipe, make sure to snap a photo and post it on Instagram with a hashtag #lavenderandmacarons. Beautiful herbs-infused golden crust makes all the difference in this easy Salmon Oreganata prepared on a sheet pan along with green beans and tomatoes. Delicious and perfect for busy weeknight dinner. Preheat the oven to 400 F and line a large sheet pan with aluminium foil. In a large bowl combine potatoes, beans, 3 tbsp of olive oil, 1/2 tsp salt and 1/4 tsp pepper. Mix everything nicely and arrange on a sheet pan. Bake for 10 minutes. Meanwhile in a medium bowl mix together breadcrumbs, oregano, garlic powder, Parmesan, lemon zest, 1/2 tsp salt, 1/4 tsp pepper and 1 tbsp olive oil. Cover salmon with Oreganata mixture pressing it into the top. You can also briskly spray salmon with cooking spray for an extra golden crust. Remove vegetables from the oven, move them over to one side of the sheet pan and place salmon crust side up. Continue baking for another 15 minutes or until salmon internal temperature reaches 145 F and vegetables are tender. You can also use regular potatoes, cut into cubes.